My second foray into ultra-running and once again I was blessed with perfect weather – blue skies, warm sun, light breeze. Good start. In terms of comparison with my first ultra experience, however, that’s where any similarities ended. In fact, the difference between the two ultras was akin to the difference between a 5-star hotel and a room over the pub. There was no spoon-feeding here; no cotton wool wrapping. Somehow it made it much more real – and more natural; more challenging and also more daunting. I bumped into Loxley Crawshaw in the car park – a fellow 100k-er from London to Brighton. A friendly face was most welcome at the start line although I knew he wouldn’t be around for long. 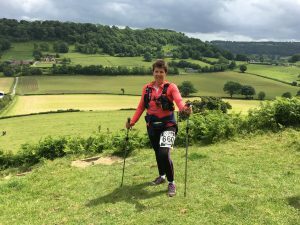 We had two very different race plans – his being to go out hard and keep going, mine being to go out slowly and just do whatever to get to the finish, ever wary of my inexperience. I learned a lot during my first 100km race but I had a feeling this High Peaks 40 Mile Challenge was going to introduce a whole new meaning to the term ‘learning curve’. I wasn’t wrong. A vague hand wave (there may have been a whistle, who knows …) and we were off. I felt good – and I loved loved loved the real ‘trails’! There was no warm-up to the first hill, though. Those peaks came thick and fast, the views were jaw-droppingly gorgeous and I was feeling on top of the world. My body, I’ve learned, will moan, shriek and howl like crazy over the first 15 to 20 km of any run, so I was quietly ignoring all the complaining and pacing myself perfectly, but it didn’t take long till I realised that one particular niggle was not something that was going to go away. Not five miles in and I was forced to stop and stretch my IT band. I was gutted. Demoralised, demotivated and downright pissed off. I hadn’t had an IT problem for months. Now? NOW? It had to surface NOW? In hindsight I figure it was those blasted initial downhills. Descents had reigned in those first few miles and the combination of hard surface and my obviously rubbish downhill technique now left me facing the entire rest of the race with an injury that was only going to get worse. I was angry and upset and bitterly disappointed. But neither anger, upset nor bitter disappointment were going to be of any practical use in my quest to finish this race ‘no matter what’, so I adopted a philosophy of stretch, run what you can, concentrate on the ascents and limp/crawl/stagger all the downhills. At least I was not alone in my world of injurydom; fellow racer Kelly Thorn and I decided by the 10 mile mark we might as well introduce ourselves since it was becoming quite apparent that we were going to be spending a lot of time either together or within yelling distance. The company was hugely appreciated as the course got more and more demanding (in beginners’ terms, at least). The ascents got steeper and the terrain definitely ‘difficult’ at times. Mam Tor – the first biggie of the day – made Ditchling Beacon look and feel like a speed bump. Accessed by innumerable gigantic steps, I was very grateful for the hours I’d spent on Jacob’s Ladder in Brighton! At the top, our running duo became a foursome as we were joined by two MDS trainees on their first MDS training run – and who’d already put in a couple of ‘alternative’ kilometres … all in the name of training, of course LOL The subsequent and partly sub-conscious boy v. girl competition worked wonders for the rest of the course and proved excellent distraction from shooting pains up my right leg, now accompanied by a nostalgic childhood sensation of drying blood around the gash in my left knee where that ‘difficult’ terrain had scored a definite few points. Mam Tor was swiftly and cruelly followed by Cave Dale which was, in short, brutal. Was it because I hadn’t trained enough? Was my nutrition already off at this point? Was it because it came so quickly after climbing Mam Tor? I still can’t answer that but if Mam Tor was steep, Cave Dale was Energy Sapper Extraordinaire – something that didn’t escape the watchful eye of a cute 4-year-old picnicking with his parents who summed it all up when he piped up as loud as can be ‘Ooooo, it’s really ‘ard werk, isn’t it? The observation brought all four of us to a walk, as we just couldn’t muster the energy to laugh and run at the same time! It was soon after that that Kelly asked me straight out ‘Will you finish?’ I’d been really struggling, over-compensating with ‘alternative’ running styles and God knows what else! It was a defining moment, however, that moment when she asked that question, because it was the moment I realised I’d learned something about myself that I was quite proud of: it dawned on me that the idea of stopping or not finishing had never once crossed my mind. I’d thought of stopping to stretch, maybe even resting, perhaps stopping and eating something half-decent from my backpack, or attempting to tape my leg …. but I had never considered not completing the course. Perhaps that makes me an even bigger fool – it was a proud fool who kept going! Thankfully, at the last-but-one checkpoint there was a HOT DRINK. It must have been the heat that enabled me to finally keep some fluid in my stomach. Just as well, as the MDS lads had set off quickly with renewed energy knowing that the finish line was close, and that meant only one thing: they had to be caught. They were caught. They were caught crying – or was that Kelly who was crying? I know it wasn’t me because I didn’t have the energy (much less enough fluid in me to create tears lol). Just 3 miles to go and look what appeared around the corner … the most lethal and horrendous gorge. It hadn’t looked like that on the map – it had just looked like a little hill, but it did (it really did) reduce competitors to tears!! OMG it was scary. I’d love to have gone down it on my bum but the path was only wide enough for half a bum-cheek! There was bugger all to hang on to and …. one wrong step and it was a long way down. Oh yeah! Scary times! But the bonus was that I didn’t give a toss about the ascent on the other side – the relief of reaching the bottom still upright was all the boost that was necessary. 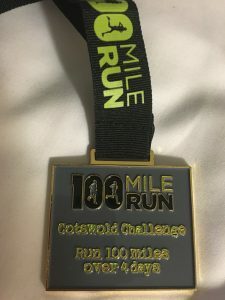 The last mile was predictably interminable and I confess that terrain, nutritional errors, hydration hiccups and injuries had definitely taken their toll by then. The agreement with Kelly to sprint the last 100 metres together was torn up and replaced by a 50m pledge – which was subsequently also shredded. I think the final sprint was the length of 5 large paving stones which led to the finish line checkpoint. And claim that it’ll be hard but fun? You’ve got to be utterly nuts. You’ve got to be out of your mind. Talking fartlek and split-times, and LSD dates! There are those who’ve been locked up for less. And trawling through websites for specialist knowledge? The men in white coats will be round! And beaming – can’t wait to get out there again! You haven’t stopped grinning for weeks! And joyful of mind, though your body is weary? How hard can it actually be, besides? How hard can it actually be? To run a few hills, bit of tempo, a sprint? Then lunch on a smoothie, a few squares of Lindt? I might just be tempted as well. And the magic appeared! Am I out of my mind? But they won’t catch me up because I can run longer! First ultra, one hundred k run and I’m fine! Get out there and give it a go! 0355 hrs, Teddington Travelodge, London. Alarm goes off. Phone intentionally left on the other side of the room so I’ve got to get out of bed to hit ‘Snooze’! It’s a teeny bit early, but I need that nine-minute snooze time to re-group and start sorting my head without panic, stress or rush! Plenty of time for that later – in about nine minutes’ time. 0409 hrs. IT’S MY BIRTHDAY!! Well, no, it’s not – but the ‘0409’ bit is right – sounds like it’s a good time to get up, too! Kettle on, shower, TV on to check weather. Blue skies all round = perfect. Already I can take waterproofs out of backpack and transfer to 50km drop bag – yay! Instant porridge at the ready, smoothie with guarana …. and all-important cup of tea! Breathe! 0445 – taxi in 15 mins. Tipping out my backpack yet again. Let’s just check if there’s anything else I can get rid of. I think I’ve done pretty well. I’ve seen pics on facebook of what some people are carrying. I don’t even have that much in my bathroom!! But maybe they’re right and I’m wrong? Who the hell knows? I have absolutely NO idea what I’m doing here. You don’t need to pack a bag for a marathon so gearing up for this is as much guess work and personal choice as anything … and common sense, I think. And let’s face it, I’m not out to break any records, but I’m aiming for success at the very least so my knees are No. 1 priority, which means the less weight I’m carrying the better. For future reference, I’m posting my backpack/drop bag contents separately. Right now, I’m more concerned about the fact that I’ve typed the words ‘future reference’! Worrying. Taxi’s here. Bags packed, drinks sorted. Richmond Old Deer Park is a-buzz! Runners pour in and out of the registration tent – and in and out of the Portaloos! All look terribly professional and ‘in the know’. 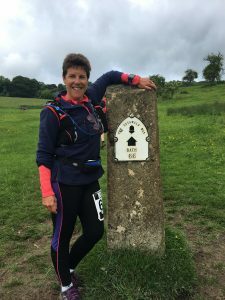 I definitely feel out of my depth – and almost a bit of a fraud calling myself a ‘runner’, since I’m well aware there’s going to be a helluva lot of walking involved!!! But according to the rules, the fact that I’m running ‘any’ of it classifies me as a runner rather than a walker. It’s scary to find myself in only the second wave of runners, though. My start time is 0615; the final wave of challengers won’t leave until 1030! Paul from Rockinghorse Charity taps me on the shoulder and offers me an array of goodies – chocolate, jelly beans, face towels and I don’t know what else. I pick up a bar of chocolate, thinking that later on I’ll probably be screaming for the comfort (how wrong I was!). We are corralled to a seemingly obligatory warm-up with ………………… Mr Motivator!! *bites tongue* He’s superbly good at what he does. He is. He really is. Interestingly, nerves have gone. I’ve banished all thoughts of what’s ahead. My plan is to concentrate on just one kilometre at a time and to do what I keep telling my running clients to do: to ‘not’ – as far as can be helped – get easily mesmerised by that point on the ground that’s always a couple of yards ahead; to remember to look up and enjoy the view! And what views!!! (Now, I speak for the first 50km. Things went rather ‘differently’ after that – but the first 50 were glorious!) Blue sky has made all the difference; the Thames is perfectly still, the path winds alongside it, passing houseboats galore. There are swans, there are geese and there are ducks on the path – and newborn ever-so-fluffy and delightful ducklings on the bank. I’m rubbish at finding words to describe just how tranquil and glorious it is so I’m going to leave that firmly planted inside my head rather than bore you with clichéd trashy descriptions that mean absolutely nothing. I spend the first hour or so juggling between watching my pacing for fear of going out too fast (although that term is extremely relative in my case lol) and chasing other runners in the distance for fear of getting hopelessly lost! I cannot find my way out of a paper bag so my biggest fear is not just taking a wrong turn, but not being able to read the bloody maps to find my way back again!! And that would most certainly not be due to a ‘lack’ of maps! Yes, I have the given route maps – but my darling husband – who is even more despairing of my inability to distinguish south from north as I am – has painstakingly spent hours printing out tiny section maps with details of every field, path, alleyway, tunnel and trail. I think the only thing missing is a list of names of the rabbit families living in the respective clearly marked warrens!!! But I learn two things very quickly. (1) That it is neither advisable to look for too long at EITHER the point on the ground two yards in front of my feet OR the view – because it only takes a second to sail past a directional arrow; and (2) once you get into the habit of looking for those arrows the Action Challenge organisers have done the most amazing job of posting them EVERYWHERE!! This might seem incredibly trivial but with such a lengthy challenge ahead it was very easy to get lost in one’s own thoughts, to get distracted, to lose focus – and that was all the time it took to miss that next crucial arrow. Several kilometres go by and I’m continually fascinated by how much discipline this takes. At least, it seems like that, initially. Running along on my own, I spend the first hour making a point of not missing an arrow, not running too fast, not running too slow, not getting distracted by gorgeous views …… so many things running through my head. Perhaps the nerves aren’t quite as ‘gone’ as I thought!! You live and you learn. Every minute of this race turns out to be a learning experience – and one which I wouldn’t give up for the world! I start to settle down a bit. I can enjoy the views; I stop looking at my watch and start listening to my body instead; my pace sorts itself out; and I’ve got the hang of spotting those arrows! The plethora of arrows, however, is also responsible for one goddamned song to be hammering around in my brain for the next four hours. At the risk of showing my age, who remembers it? Sing along with me now ………………… Here they come, falling out of the blue; Little arrows for me and for you; We’re falling in love again ……… (followed by) ‘Little arrows in your clothing, little arrows in your hair; When you’re in love you’ll find those little arrows everywhere …’ Even more tragically, I have to admit that yes, I know ALL the words L But it’s a small price to pay, I guess, for the incredibly helpful, accurate and prompt signage all along the route – a credit to the organisers (and one MASSIVE weight off my shoulders as I realise there is little worry about getting lost so long as I stay focussed). You get the gist …. I’m not going to set out a km-by-km account of my first ultra! The only person who needs to know all that is me! But hey! It feels good to be able to say ‘ultra’! 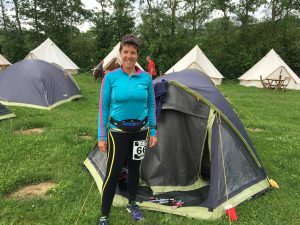 I remember I passed 46.2 km and I clearly recall letting out a very quiet and rather pathetic cheer because it was that silly moment when I could officially say I was an ‘ultra-runner’! I know – ridiculous – but at the time it was ultra-important! To me, anyway. Having failed to reach the start line of my first marathon four years ago, I’d never believed I’d be able to tick that goal off my to-do list .. and I’d just exceeded it. Yup! That felt good!!!! Green Lane mid-point 11.9 km I’ve settled down. 10 mins ahead of predicted schedule. Wahay – the advantage of being a runner is that there are no queues for the loos AND they’re all still clean. My day is made! Now, if only I can keep ahead of the pack lol Quick top up of water bottle and I’m off. CP1 – Oaks Park 24.7 km Lunch! LUNCH? Are you kidding? It’s 9.30 a.m. I’m taking 20 mins to regroup. This is where it gets complicated …. I’ve no benchmarks. Do I stop here or keep going? 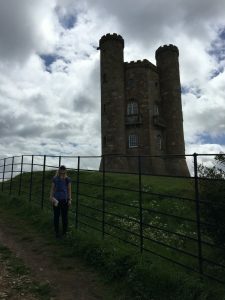 Is it good to sit down/rest or should I get the hell out and keep moving? To eat or not to eat? Not having any experience, I’ve no idea what to do here. I grab a cup of tea and sit down to work it out!!! Decide on 20 minute break which in retrospect I could probably have gone without. The problem is not the first 50km – the problem is not knowing what my body is going to do after that! Oh well … who’s to know? I can sit here and debate it …………………. Or I can get moving. I grab a homemade flapjack from my backpack (these became my staple and thank God I made them! ), top up drinks – one with water, one with High5 energy drink … and decide I can do the rest of my pondering/eating while I’m walking! Orpheus Centre mid-point 37.6 km Oops! My bottles are still full. That’s not good. I down a few cups of water and promise myself to have drained both bottles before the next checkpoint. Besides, it’s warm. Hat and gloves are off – for me, that means there must be sunshine! Mind you, it’s been hard work ploughing through all that mud!! I can’t decide whether the mud is irritating or funny. I wish I could see how the ‘real’ runners are dealing with it. I wonder are they just going straight through it? I’m too chicken to try – it’s so slippery and up to 6-8 inches in places. I don’t think I could ‘run’ it even if I tried. I’ve done my best to get past it as quickly as possible, though. Note: Ladies … when the path is narrow and there is a line forming of TWELVE RUNNERS (I counted) behind you … it’s time to move the f*** over!!!!!! Am I right or am I right? To me, that’s just common courtesy – but maybe that’s why I never win everything. Maybe I should try holding up the field, elbows at the ready? Just kidding – but you know what I mean. I’m out of there! More mud, mud, glorious mud. It’s a good excuse to walk, innit!!! But you’ve really got to have a sense of humour. I come across one section, stop dead and laugh out loud! The mud is so bad they’ve thrown down planks of wood followed by eight car tyres, tied together. It’s L2B meets Warrior Dash! Brilliant! I am so glad I’m running right now – I would not like to have to face this obstacle in the dark! And then there’s the stiles. I think I’ve climbed over more stiles on this route this morning than I did in ten years living in the middle of Ireland! And some of them – Oi! – were constructed by VERY TALL FARMERS!! Jeez! There is one particularly ‘high’ one that I’m struggling over when I hear a voice behind me. %£$%&$£^&!!!!!!! Hate to say it, but yes, there is a big gap right beside it. Doh! What an idiot! But out of that laughter comes the start of a beautiful ultra-friendship! I’ve passed Stephen and Eric a couple of times en route as they stopped to take photos – then they’d pass me again twenty minutes later, etc. etc. As we pass that stile (or climb it, depending on your level of utter stupidity!!) … we are on the approach to the 50km checkpoint and are all starting to feel weary. As we jog along chatting about Lord knows what, we are joined by Neil and Stu … all making our merry way at roughly the same kind of pace. I have to say it is WONDERFUL to have the company and yet not be worried that any kind of ‘pace’ is being forced on anyone. We just settle in together and reach the next checkpoint an impromptu team. CP2 – Felbridge Tennis Club – 53.5 km 45 mins ahead of my predicted time so happy but slightly shell-shocked. 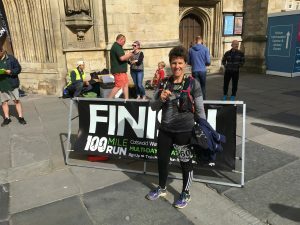 I’ve run 50km – woo hoo!! What else matters! Except the job in hand, I guess. My wonderful crew is waiting for me in the form of Karim. He grabs my backpack and refills my drinks. I help myself to hot food – God, that tastes good! Haven’t eaten for a while. I thought I’d be constantly hungry. Wrong. Re-stock gels. Take bite of blueberry muffin, thinking something sweet wouldn’t go amiss. Wrong again! Stomach says ‘NO!’ At previous midpoint I phoned Karim and begged him to bring some fruit – grapes, pineapple … as I was gasping for it – but already I it’s a struggle to eat anything. Weird and unexpected! Down a half litre of coconut water, run through checklist again. Guarana shot – pure magic – and it’s time to go. Loving, absolutely loving all the psychological ‘surprises’ along route – so, so different to anything I’ve done before. A dodgy few seconds here. In the moment it takes me to stand up, my elation of ‘Wow! Already half way!’ switches to ‘F***! Only half way!’ At that very moment I hear a now familiar voice behind me (again) … ‘Ready, Amanda? We’re not leaving without you, you know!’ I just can’t tell you what a difference that made. I’m suddenly ‘part of a team’ and it’s all I need. Mindset readjusted. We’re off! What’s more, I think this is my favourite 10k of the lot. I feel like I’ve got a new set of legs – the hot food? The guarana? The rest? Or great company? Whatever … it feels great. And, of course, I already know I’m going to finish this course or die trying … there’s no going back after half way! Highbrook Field mid-point – 64.7 km No stopping. Let’s just get this section done. The going’s good, the plan is not to break the rhythm. Mud has been replaced by marsh and I’m not sure which is worse! Wet, wet, soggy uneven clumps of long grass and seemingly endless fields of it! Ugh! Things suddenly start to go pear-shaped. A few injuries have crept into ‘the team’ and pace has slowed. Spirits still high! CP3 Ketche’s Lane Field – 73.1 km Final stop. Erm … (Note to Self: Don’t know what to change but something needs to change at this point next time round) Spirits are high! Karim is there waiting – refills bottles. No energy drinks please! Can’t stand the thought of eating …. Until I walk into the tent. Bacon and sausages … that’ll do! Bloomin’ lifesaver. My stomach is just rebelling against everything else. I think it must be the fact that it’s hot? Everything else food-wise has lost its appeal – can’t bear the thought. Never mind, though. Home stretch, eh? But it’s going to be tough … I’m ignoring everything but well aware that it’s not going to get easier. IT bands on both legs are screaming – it’s a familiar scream. I can cope. 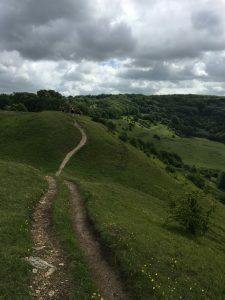 Karim reminds me I’d planned to maybe change trainers – I had thought different trail shoes might be good for coming over the Downs and a change of support would give my knees a break, too. It’s not going to happen. My feet are swollen (in fact, I think it’s just my big toes!!) … and I can’t even get into my trail shoes. Decision made, then. Ibuprofen makes an appearance – and last guarana shot of the day. Quick change of attire – extra layer of clothing into backpack, hat and gloves accessible, headtorch accessible. Procrastination is not going to help. Move! We’re not laughing quite so much any more. I think we’re struggling to keep upright! We stop here just a little bit longer than we should have. Neil has left us – determined to make that midnight rendezvous. He’s marched on ahead. Good on him! Eric has disappeared, too – accompanying a girl who we found walking on her own and who had no torch – complete madness! Stephen and Stu sit down and finish off a hot drink. I don’t dare sit! I’ll never get up again. I’m itching to keep moving before I come to a total standstill. It’s a wall. So it’s only maybe 3 feet high, but a wall nonetheless – needs climbing over!! Swann Inn, Falmer mid-point – 94.4 km I’m officially bloody freezing but I haven’t dared stop to access the layers from my backpack – I don’t want to break any kind of rhythm, I just want to keep going. Running is no longer an option so it’s dead slow – all the more reason to keep moving forwards! Relentlessly! Finally – a stop where I can layer up. I empty my backpack and everything goes on! Better! Eric’s back – waiting for dad (Stephen) to do the final stretch together. Stu is in serious trouble. It’s taken us a long long time to do this last stretch – there’s been a lot of downhill and it’s been a curse. Give me uphill any time!! Stu’s knee is a lot worse than mine – the only way he can come down the hills is backwards!!! At any other time that might be funny – actually, yes, we laugh. At one point I look back at him and crack up completely because I honestly can’t tell if he’s walking forwards or backwards – his legs are so stiff it’s like watching a robot. The water in that damned drum thing won’t heat. I don’t care. I’ll go on without it. The support crew guy says we should pop into the pub and warm up for a few minutes – too cruel!! He’s serious and has asked the pub for permission. He needs to run this race next year to understand how vital it is that that pub door never opens!!! Not here and not now! 6 km to go. Really can’t stop. The water’s not hot enough to make a tea, but one of the support crew ladies runs after me with a cup of warm water – better than nothing, she says. She’s right. We drink while we walk. Stu has stayed behind to get his knees strapped up. I’m not worried about him. I know he’ll finish – no matter what. It’s definitely a trudge and these must be the longest six kilometres in history. Can’t see a thing, tiny uneven little tractor-wheel paths through fields, alongside roads … but at least I know where I am, now. I can happily tell the guys where we’re heading. Racecourse is just up around the corner. And …………… there it is! I’ve managed to keep my feet perfectly dry up to now. The racecourse grass is long and sopping wet. Drenched and freezing feet. Who the hell cares! Red flags up ahead. Spotlights. We’ve agreed that no matter what, we’ve got to run at least the last 200m. We break into a jog and a huge cheer greets our bobbing head torches from the finish line. Caitriona’s there with a gang of nine very loud teenagers …………. and there’s Karim … and Chris … and Rebecca!! It’s just SUPERB!!! Dammit! Now I’ve burst into tears. Crossed the finish line. 19 hours 5 mins. 142nd place of 1362 who made it to the start line. Recognise and ditch the excuses – that done, everything’s possible! Note: This is for personal reference only!! God knows but the contents hereinafter will possibly shock and appal the seasoned ultra-runner. Let me re-emphasize the fact that I had NO idea what I was doing or what was in store. I’m keeping this and will add notes as and when I acquire useful (and knowledgeable) titbits of information from the pros. Having said that, it kind of worked for me so it can’t be too far out. OMM backpack … tried, tested and I love it! I use a Camelbak on long cycles but found this heavy for running (all relative, I guess). The weight distribution of a Nathan 2-bottle race belt worked better for me. Flapjacks – homemade and yummy. Heavy, though – in weight (all relative, of course). Two in backpack. Will have them for ‘lunch’. Compeed – weighs nothing and just in case – rumour has it to treat immediately so don’t want to be waiting until I reach a subsequent rest stop. Ibuprofen – don’t care what reason, but if a headache looms at the start line I really want to be able to get rid of it fast.